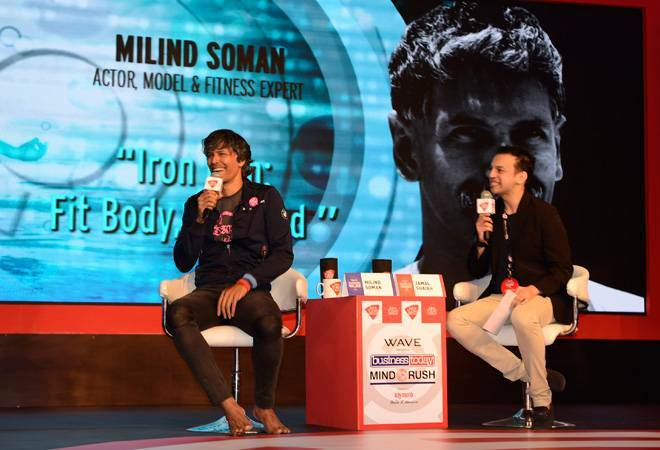 The second and final day of the event 'fittingly' started with a session addressed by actor Milind Soman, who completed the 'Ironman Triathlon' held in Zurich, Switzerland, earlier this year. The third edition of Business Today MindRush concluded on Saturday with renowned author Ashwin Sanghi's insightful session on how Chanakya's - touted to be the 'Pioneer Economist of India' - treatise on economy, politics and diplomacy is still relevant for today's businesses. In fact, he said, it is the foundation for global governance and businesses. Soman, who, at 50, epitomises youth and fitness, shared the secret of his healthy lifestyle with eager audiences. His suggestion to fitness freaks and those looking to delay the process of ageing is to not only work on the body, but also on the mind. His advice to those 'finicky' about (unhealthy) food is "to eat food your body is comfortable with. Your body knows what it needs." A food for thought, indeed, for those who think only certain kind of diets or meals are healthy. Soman's session was followed by an engrossing discussion on internet-based start-ups. Titled 'Online and on fire: Catch them if you can', the discussion had Amit Jain, President, Uber India; Amarjit Batra, CEO, OLX India; Sanjeev Agarwal, Co-founder of Helion Advisors; Suchi Mukherjee, Founder and CEO, Limeroad; and Radhika Agarwal, Co-founder and Chief Business Officer, Shopclues.com, talking about the opportunities, challenges and the way forward for online start-ups in India. While Soman's session was all about the health and well-being of the body and mind, the session (incidentally) after lunch focused on the health of the country's economy. It was addressed by the country's former Finance Minister P. Chidambaram, who is known for his straight talks. Not one to mince his words, Chidambaram said that not everything is hunky-dory with the Indian economy as the government would like us to believe. He backed his statement with statistics. He pointed out that the country's nominal GDP growth rate has come down to 6 per cent, something that only happened 50 years ago. According to Chidambaram, if nominal GDP continues to grow in the same fashion, it will have a serious repercussion on the government's fiscal burden. He also talked about the fall in exports for the 12th consecutive month. He dismissed the government's claim that there has been an increase in public investment. He also said that there are few signs of stalled projects getting revived or private sector investments picking up. He questioned the latest industrial growth numbers. "At 9.8 per cent, the IIP growth looks impressive, but this high growth in October was because of base effect. Adjusting this growth, it remains in the range of 2-3 per cent. I suspect there is distress in rural India and growing stress in the agricultural sector," he stated. After Chidambaram's rather critical analysis of the country's economy, the audience needed some motivational talk to cheer them up. That was amply provided by renowned leadership and motivational expert Susan Fowler. Fowler busted the traditional thinking on motivation by announcing that "incentivising people is no more relevant." According to her, the new norm is day-to-day motivation, where one's psychological needs are met, as opposed to one-time incentives. Fowler's interactive session was not only a hit among the audience in attendance, her thoughts and words of wisdom were cheered on by Twitteratti too. Fowler was trending in India on Twitter.